Traditional Name: Kha'p'oo Owinge (Valley of the Wild Roses.) The Pueblo is a member of the Eight Northern Pueblos, and the people are from the Tewa ethnic group of Native Americans who speak the Tewa language. The Pueblo is on the Rio Grande, between Ohkay Owingeh (formerly San Juan Pueblo) to the north and San Ildefonso Pueblo to the south. Santa Clara Pottery and its Pueblo are famous for producing hand-crafted pottery, specifically blackware and redware with deep engravings. Thanks to cultural pride and a strong sense of identity, the Santa Clara people have retained many of their ancient traditions while integrating with the best of what the majority culture has to offer. The Pueblo has a high regard for education, both the tribal heritage and modern education. Santa Clara Pueblo people find employment on the reservation as well as in nearby cities. Some dances and community festivals are open to the public. In June, St. Anthony’s Feast Day features Comanche Dances. In August, Harvest Dances and Corn Dances are performed in honor of the patron saint, St. Clare. 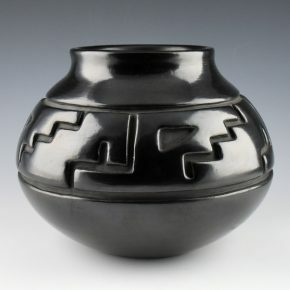 Regarded as one of the great masters of Pueblo ceramics Margaret Tafoya (1904-2001), a matriarch of Santa Clara Pueblo, is known for her trademark large black polished ceramics. Margaret decorated with traditional imagery of rain clouds, water serpents, bear paws, and other family symbols. An award-winning artist, she was the recipient of the Lifetime Achievement Award from the Southwestern Association for Indian Arts and a National Heritage Fellowship. She had twelve children, eight of whom became potters; Virginia Ebelacker, Lee Tafoya, Toni Roller, LuAnn Tafoya, Mela Youngblood, Jennie Trammel, Mary Ester Archuleta and Shirley Tafoya. Her grandchildren and today great-grandchildren carry on the traditions of making pottery. Margaret was a guardian of traditional pottery making methods and techniques. She created large storage vessels with stone polished surfaces. Her carving was done before the piece was polished. She created her amazing work from the 1920's through the 1980's. 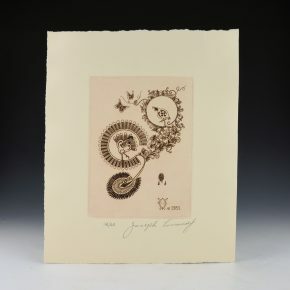 Joseph Lonewolf created a series of original etchings based on designs from his pottery. 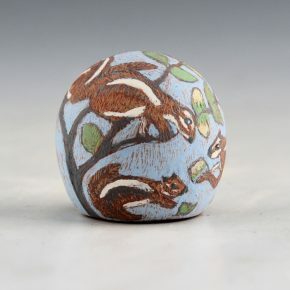 This piece has quail and butterflies as the design. 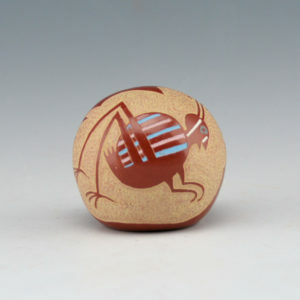 It is very intricately designed with many of the same motifs he used in his pottery. It is dated 1981 and signed and numbered 18/60. It is in excellent condition. This is an original etching by Rosemary Lonewolf. The figure is a Corn Spirit holding an ear of corn and surrounded by a corn stalk and pollen. It is 4/60 and titled, “Corn Spirit’s Fertile Form”. It is signed, “Rosemary Apple Blossom Lonewolf”. It is in excellent condition. 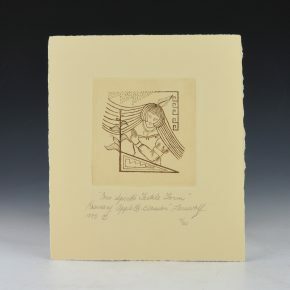 This is an original etching by Camilio Tafoya. It uses similar designs to those in his pottery. 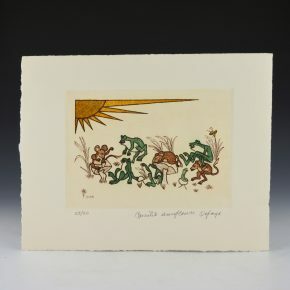 Here it depicts a charming combination of frogs and mice playing in the sun. There are additional colors added to the etching. This piece is 23/60 and it was printed by El Cerro Graphics, who printed all of Camilio and Jospeh’s etchings. It is dated 1981 and signed, “Camilio Sunflower Tafoya”. It is in excellent condition. 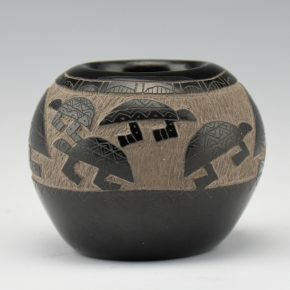 This seedpot by Art Cody Haungooah is from 1981. It is fully polished and has etched designs. There is a sunface in one medallion. The other medallion ahs a lizard and frog. This medallion is “two-toned” to make it black-and sienna. The contrast of the highly polished surfaces and the color from the sienna is striking. Art was Kiowa and married to Martha Suazo from Santa Clara and that is where he began to make pottery. The bowl is signed, “Haungooah” and a flute player. It is in very good condition with no chips, cracks, restoration or repair. While Nancy Youngblood is known for her swirl melon bowls and carved pottery, she started out her career making miniatures. This miniature is from 1975 which makes it a very early piece of her pottery! It is a miniature kiva bowl and it is fully polished on the inside and the outside. The edges of the kiva steps are matte in contrast to the highly polished surface. Note as well the little holes in the sides of the kiva steps. On larger pieces the holes would be placed in the kiva bowls so that eagle feathers could be attached. It is amazing that she was able to replicate this concept in miniature! The bowl is in excellent condition with no chips, cracks, restoration or repair. It is signed on the bottom in the clay, “Nancy Yellow Aspen ’75”. 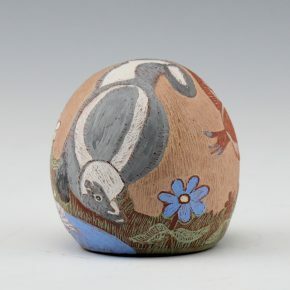 This seedpot by Art Cody Haungooah is from 1977. It is fully polished and has a single etched medallion. The design is the “Mosquito Man”. It is a design which is found on the kiva murals at Pottery Mound, NM. The last photo is the Mosquito Man from the actual murals. On this piece, Art depicted the figure with a striking similarity to the actual mural figure. The remainder of the piece is highly polished. It is signed, “Haungooah” and a flute player. It is in excellent condition with no chips, cracks, restoration or repair. SaraFina Tafoya was the matriarch of a family of renowned potters, including her children Margaret Tafoya, Camilio Tafoya, and Christina Naranjo. While she is known for her large vessels, in the 1930’s she created a series of smaller painted and plainware vessels which were signed. They are unusual and scarce pieces, yet a fascinating part of the history of Santa Clara pottery. This is an exceptional polychrome plate. The design in the center is a boar and it is surrounded by an avanu (water serpent). They are both painted with a red clay slip and accented with white and gray. The design of the boar is unusual in Santa Clara designs from this period. 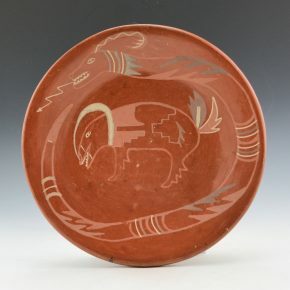 The plate is signed on the back in the clay, “Serafina Santa Clara Pueblo”. It is in very good condition with no chips, cracks, restoration or repair. To learn more about the SaraFina’s signatures, check out the new article by Charles S. King, “Signed SaraFina”. SaraFina Tafoya was the matriarch of a family of renowned potters, including her children Margaret Tafoya, Camilio Tafoya, and Christina Naranjo. While she is known for her large vessels, in the 1930’s she created a series of smaller painted and plainware vessels which were signed. They are unusual and scarce pieces, yet a fascinating part of the history of Santa Clara pottery. This bowl is a classic piece of painted pottery and has a fascinating provenance. 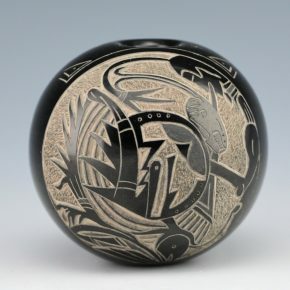 The bowl was originally acquired in 1933 by the Denver Art Museum. It was included in the book “Margaret Tafoya” by Mary Ellen and Lawrence Blair on p. 53 (fig. 2-19). The bowl was later deaccessioned by the DAM and ended up in a private collection. The bowl is fully polished and painted red-on-red with a lightning design. The designs are highlighted with a white clay slip. It is a complex and varied design which relies as much on the matte painted areas as the negative polished space. The bowl is signed in the clay on the bottom, “Sarafina Tafoya”. It is in very good condition with no chips, cracks, restoration or repair. Interestingly, it still has the original catalog number for the museum as well as the museum card. Definitely a great piece of history! This is an exceptional original clay piece by Roxanne Swentzell. It is entitled “Indian On the Edge”. The figure is one of the few males she has made during her career. There is a look of uncertainty in the eyes of the eyes of the figure as he is looking over the edge. The piece sits almost flat but when placed on the edge it balances out. Roxanne had said of this piece, that, its quizzical look and inability to sit evenly on a flat surface is about the feeling of being stranded between two cultures and unable to be comfortable in either one. It is definitely a powerful piece of her work and a great statement on the lives of many native artists. The hair is sculpted with clay hair ties which extend to the back and the side. The parrot feathers are tied in bundles and added to the piece. The sculptural quality of the hands and feet is striking on this figure. This piece is in perfect condition with no chips, cracks, restoration or repair. It is from early 2000 and signed in the clay, “ROX”. This is a classic original clay piece by Roxanne Swentzell. It is entitled “The Seduction”. 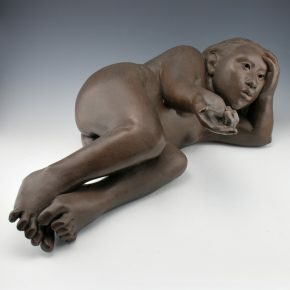 The figure is made from clay and she is in a reclining position. Her one hand is holding up her head while the other is extending outward with the finger extended. She is beckoning the viewer forward. There is a gentleness to the figure and the face. The continuous coloration of the figure accentuates the form. Note the detail in the hands and the feet as well. This piece is in perfect condition with no chips, cracks, restoration or repair. It is from early 2000s and signed in the clay, “ROX”. Nathan Youngblood has long taken inspiration from the world around him. His work for decades has drawn inspiration from both Pueblo and Asian art. When he was a young boy, while his father was in the military, they were stationed in the Netherlands, and he said he would often go to the museums and look at Asian ceramics. That has been a life-long love affair with those distinctive forms and designs. 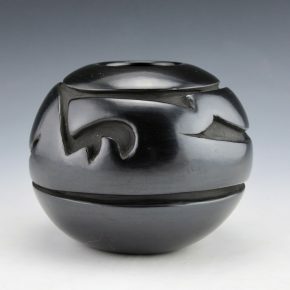 This jar has a very Asian form and the designs play out the duality at times found in his art. Around the shoulder on one side is a dragon and then the opposite a water serpent (avanyu). Each facing the other. There are two opposing medallions, one with Pueblo clouds and the other a cipher. Around the neck is a band of clouds and around the base, in tan, is a band of clouds, wind and eagle feathers. The deep red clay slip on this jar is exceptional and contrasts perfectly with the tan and matte areas. While the shape, carving, and designing might seem like enough, Nathan also takes his pottery one step further. After it is fired, he uses small screwdrivers and scrapes the sides of the carved designs and the recessed areas, to create a visually striking contrast. This style has been called, “the new Santa Clara polychrome”, although I usually called it “tri-color” with the variations of red, matte and buff areas. The jar was traditionally fired. 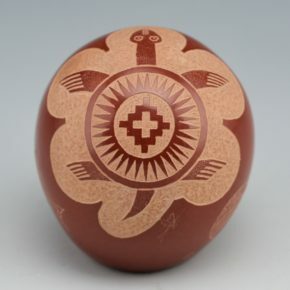 The result of various levels of color and imagery make for an exceptional jar that is certainly a reflection of how Native art has become a world art, and the two are meeting as equals. Nathan Youngblood has long created his own “lexicon in clay” with his distinctive designs which pull from Pueblo, personal and cultural experiences. This stunning water jar is an exceptional shape with a round body, a double shoulder and an elongated neck. The design is a complicated story of the eagle in the sky and the fish under the water. The fish are swimming and the double shoulder of the jar is set at such a point that it becomes the waves above the fish! 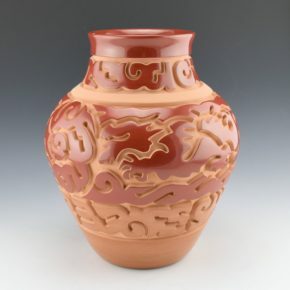 The jar is very deeply carved and the surface is polished a stunning deep red coloration. 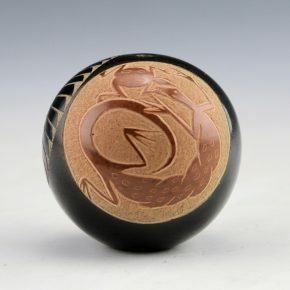 As the jar is turned the eagle and fish swirl around the surface of the piece. The lowest section of the jar is polished tan. The scene is a reflection of Nathan’s love of nature and it’s interaction with Pueblo life, culture and stories. While the shape, carving and designing might seem like enough, Nathan also takes his pottery one step further. After it is fired, he uses small screwdrivers and scrapes the sides of the carved designs and the recessed areas, to create a visually striking contrast. This style has been called, “the new Santa Clara polychrome”, although I usually called it “tri-color” with the variations of red, matte and buff areas. The jar was traditionally fired and the result simply speaks for itself. Lustrous! 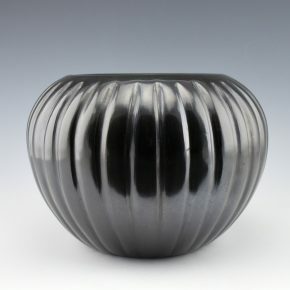 This seedpot by Gloria Garcia is fully polished and fired black. The top is fully designed with a butterfly and a flower. The wings of the butterfly are etched to create the design. The remainder of the piece is fully polished. 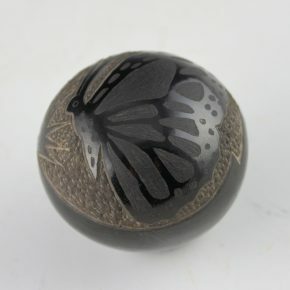 Gloria’s combination of polishing and etched designs is always striking. This piece is signed on the bottom with her Tewa name “GoldenRod”. 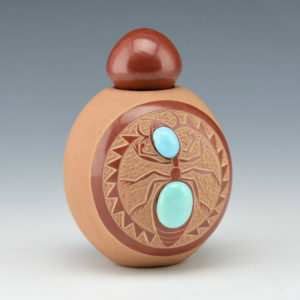 This miniature jar by Geri Naranjo is a striking shape. It has a round shoulder and a short neck. 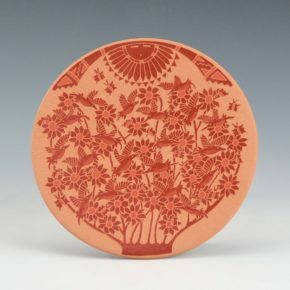 Geri is known for her miniature pottery and intricately etched designs. Here the entire piece is fully polished and around the shoulder is an avanyu and below are cloud, rain and lightning designs. The designs are all etched into the clay with precision. The remainder of the jar is very highly polished. It is signed on the bottom in the clay. It is in excellent condition with no chips, cracks, restoration or repair. 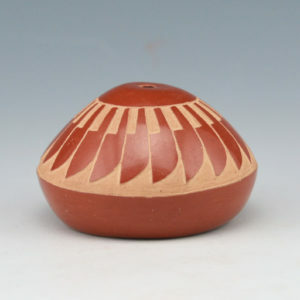 This is a classic kiva bowl miniature jar by Linda Cain. Linda is a daughter of Mary Cain and the mother of Tammy Garcia and Autumn Borts. 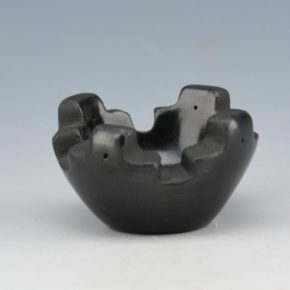 This miniature bowl is carved with the kiva steps on the rim of the piece. It is a form often seen at Santa Clara Pueblo. The outside of the bowl is polished while the inside is matte. 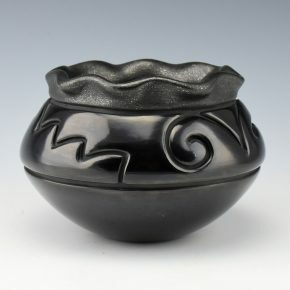 It is fired a deep black and signed on the bottom in the clay, “Linda Cain”. This large bowl by Art Cody Haungooah is from 1973. It is fully polished and has an etched design on one side. 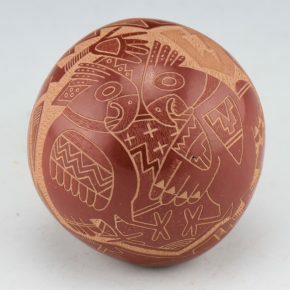 The imagery is a buffalo hunt where the design has been etched into the clay and then “two-toned” to make it black-and sienna. Note the depth and yet the symmetry of the area surrounding the figure. Interestingly, Art left the buffalo black so that it would be in contrast with the sienna of the horse and rider. Art was Kiowa and married to Martha Suazo from Santa Clara and that is where he began to make pottery. The bowl is signed, “Art Cody Haungooah” and it is in very good condition with no chips, cracks, restoration or repair. Charles Lewis (b. 1972) is a grandson of Toni Roller and a son of Susan Roller. He is a great-grandson of Margaret Tafoya. While he no longer makes pottery, his pieces from the late 1990’s were beautifully made, carved and polished. This bowl is carved with a feather pattern around the sides. Note the shape of the bottom of the feathers, which are slightly rounded. That form is very reminiscent of Toni’s style of carving. This piece is fired a deep red and it was outdoor traditionally fired. The piece is signed on the bottom in the clay, “Charles Lewis” and it is in excellent condition with no chips, cracks, restoration or repair. Each of the 16 ribs perfectly reflects the light. Added to the complexity of the jar is the lid. The ribs not only extend down the side, but over the top and down onto the base of the lid! There is a kinetic motion to them on this piece which may simply be the play of the light adding to the highly polished surface. Thee matte area on the top of the lid is perfectly sanded smooth. This is important so there are no shadows cast from an uneven surface. In addition to the depth of carving on this jar, consider that each rib has two “sides”to be polished and the surface area of the piece is about double its size! The lid and jar are signed on the bottom in the clay. 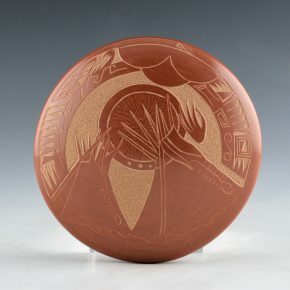 Nancy has won numerous awards, from “Best of Pottery” to “Best of Show” at Santa Fe Indian Market for her melon bowls. This is undoubtedly a classic of her clay art! The bowl is very highly polished and fired a deep red. The inside is slipped with a mica clay slip. Interestingly, Grace did all of her etching in the clay before the pieces were fired, which added to their overall difficulty. The bowl is in excellent condition with no chips, cracks, restoration or repair. It is signed on the bottom in the clay, “Grace Medicine Flower”. It is large, elegant and stunning! All the various colors are from natural clay slips. The technical difficulty in carving this piece makes it a bit surprising that it didn’t crack in drying or firing. The jar is in excellent condition with no chips, cracks, restoration or repair. It is signed on the bottom in the clay, “Grace Medicine Flower”. While Grace is no longer making pottery, this is certainly a reflection of the creativity and originality of her work! Tina Garcia was well known for her focus on traditional shape and plain ware Santa Clara pottery. This bowl is from around 2000 and it is a classic piece of her pottery. The bowl is very round in shape and there are two large bear paws impressed in the sides. The entire piece is fully polished and fired a deep red. The bear paws are part of a story where a bear led the Pueblo people to water during a drought. It is signed on the bottom in the clay, “Tina Garcia”. It is in excellent condition with no chips, cracks, restoration or repair. Teresita Naranjo was a daughter of Christina Naranjo and know for her deeply carved pottery. This bowl is one of her few miniatures. The bowl is very deeply carved with cloud and lightning designs. The designs spiral around the surface of the bowl. 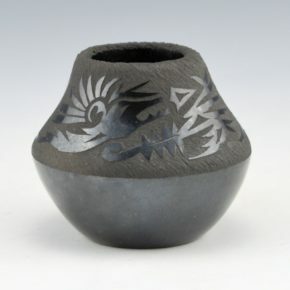 It is traditionally fired black. The bowl is signed on the bottom in the clay, “Teresita Naranjo” and it is in very good condition with no chips, cracks, restoration or repair. Jennifer Moquino is known for her clay vessels and exceptional realistic animals. This is one of her smaller tiles. It is fully polished and etched. The piece has a Pueblo girl and butterflies. The girl is designed in an “anime” style. As figurative work on pottery is often discouraged at some of the Pueblos, this style of figure is less realistic and more imaginary. The young girl here is surrounded by butterflies. Each one is a different style of butterfly. The border on the side has a cloud and rain motif. It is a contemporary and creative piece! The tile is framed so that it can be mounted on a wall. It is signed on the side. Jennifer continues to be one of the leading innovative potters working today! Helen Shupla is certainly most famous for her exceptional melon jars. Her melon jars are the very traditional form with the ribs pushed out in the clay. This melon jar is one of her classic shapes with an elongated body showing the full length of each rib. Each of the 16 ribs is pushed out into the clay. She would do this by placing her fingers inside the bowl and pushing against the clay from both the inside and outside! Can you see the slight angle to each section? This is how she would turn her hand as she was pushing against the clay to create the separate ribs! 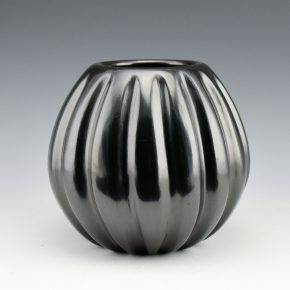 The entire piece is fully polished and fired black. It is signed on the bottom in the clay, “Helen Shupla”. It is in very good condition with no chips, cracks, restoration or repair. Tina Garcia was well known for her focus on traditional shape and plainware Santa Clara pottery. This water jar is one of her classic pieces. It is an elegant shape with a double shoulder or “rainbow ridge”. 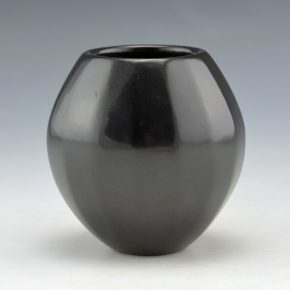 The entire piece is fully polished to a high shine and fired a deep black. Tina was always focused on form and polish and this created some exceptional vessels. It is signed on the bottom in the clay. It is in excellent condition with no chips, cracks, restoration or repair. 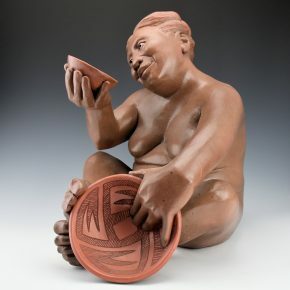 Effie Garcia is known for her deeply carved pottery. Each piece is coil built, carved, stone polished and traditionally fired. 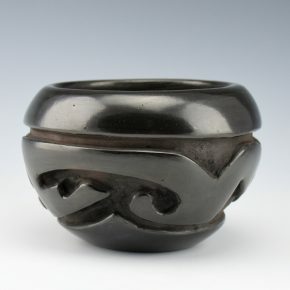 This bowl has a deeply carved avanyu (water serpent) as the design. 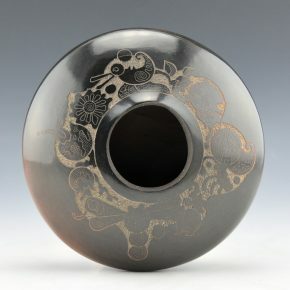 It is a varied design with water swirls as the design when the bowl is turned. Note the depth of the carving and how she has outlined the design with the clay for emphasis. It is signed on the bottom in the clay, “Effie Garcia”. This is a taller miniature jar by Geri Naranjo. She is known for her miniature pottery and intricately etched designs. Here the entire piece is fully polished with no design. It is in the shape of a high shoulder jar. The piece is very thinly constructed and highly polished. It is signed on the bottom in the clay, “Geri Naranjo”. It is in excellent condition with no chips, cracks, restoration or repair. 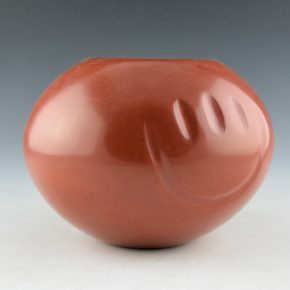 This seedpot by Joseph Lonewolf is from 1984 and it is highly polished and fired red. The design is unusual as it has a turtle as the central pattern. The turtle is not unusual but note the shape of the turtle’s head and neck and it is certainly reminiscent of the work of Tony Da in style. The turtle has a mountain design on its back and note at the lower right there is a tiny dragonfly. 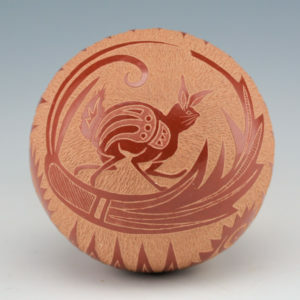 As the seedpot is turned there are two incised Mimbres style fish etch into the clay. There is also another dragonfly. There is also the yearly symbol for 1984 which has the shifting sand pattern. The seedpot is highly polished and the contrast of the matte and polished surfaces works perfectly for this desig. It is is signed on the bottom in the clay. It is in excellent condition with no chips, cracks, restoration or repair. Grace Medicine Flower began her career making miniature pottery with incised designs. This jar is from 2002-5 and is one of her amazing polychrome pieces. The jar is carved through to create the various visual areas for design. Around the shoulder are carved through sections with carved fish as part of the design. Below are sections which are carved into the clay and then slipped with micaceous clay or polished. They are then etched with additional designs. 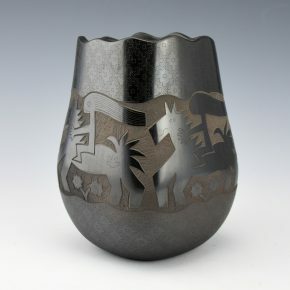 Grace has incorporated all the various techniques to make this jar, including carving, incising and etching. She has also used polished, painted and micaceous surfaces for the designs. All the various colors are from natural clay slips. The technical difficulty in carving through the clay for the open areas is surprisingly difficult and amazing that it didn’t crack in drying or firing. Note as well that it is painted on the inside with additional fish! The jar is in excellent condition with no chips, cracks, restoration or repair. While Grace is no longer making pottery, this is certainly a reflection of the creativity and originality of her work! This is a complex smaller bowl by Art Cody Haungooah. The bowl is fully polished and fired black. It is entitled, “The Ancient Ones”. There is a single medallion which is etched humanized grasshopper along with a stylized grassopper figure. This is one of those pieces where I wish I knew the story of “The Ancient Ones” as Art was masterful as a story teller. The bowl has some deeper carving (the circular lines) along with Art’s classic straffito. The piece is signed on the bottom in the clay, “Haungooah “The Ancient Ones”. It is in excellent condition with no chips, cracks, restoration or repair. This is one of the few pieces signed by both Art Cody Haungooah and his wife, Martha. Martha made the small jar and polished the surface. Art Cody etched the design. The central medallion is a howling coyote. In front of the coyote is a quarter moon. On the opposite side of the moon is a stylized bird. There is just a slight lip to the jar. The piece is signed on the bottom in the clay, “Art & Martha Haungooah 1976”. It is in excellent condition with no chips, cracks, restoration or repair. 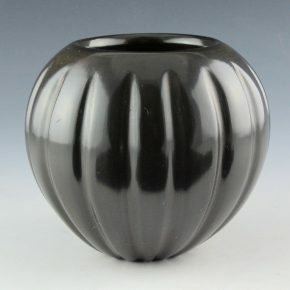 This is an exceptional lidded jar by Jeff Roller. Jeff is a son of Toni Roller and a grandson of Margaret Tafoya. He continues a family legacy of extraordinary traditional pottery. 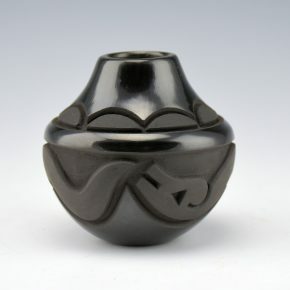 This jar is coil built, stone polished and traditionally fired black. However, the shape is what Jeff calls a “teardrop form” with narrow sides and a rounder base. The shape is also very much reminiscent of the mountain form. Jeff has carved a mountain design on each side with clouds and wind patterns above. Note the depth of the carving and its consistency throughout the piece. 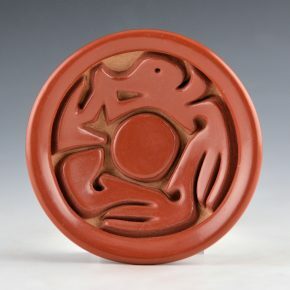 Below the lid is a half-circle sun and the lid is carved with a traditional step cloud design. Note how the carving on the sides continues up to the lid as if it is one piece! The lid is perfectly fit to the jar which adds to the overall difficulty. The piece is beautifully polished and fired. It is signed on the bottom in the clay, “Jeff Roller” and dated 2018. Linda Tafoya-Sanchez is a granddaughter of noted potter Margaret Tafoya and a daughter of Lee & Betty Tafoya. She is known for her intricately carved pottery. The jar has a wide body and a fluted rim. The fluted neck undulates back and forth around the jar and it is slipped with a micaceous clay. 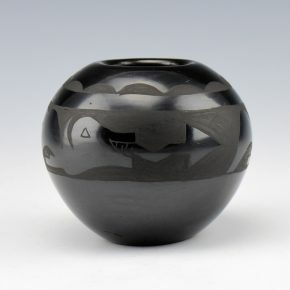 The body of the jar is carved with cloud, lightning, and mesa or mountain designs. They are deeply carved into the clay. The jar is highly polished and traditionally fired. 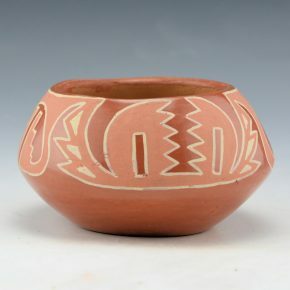 Interestingly, Linda was among the first Santa Clara potters to begin using the mica as a design element after she was given some by her San Juan Pueblo in-laws. The jar is signed on the bottom, “Linda Tafoya-Sanchez”. 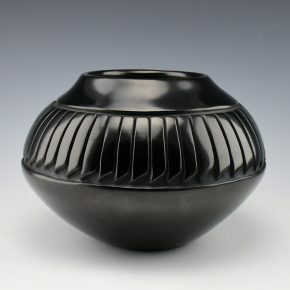 This is a classic straight ribbed melon bowl by Nancy Youngblood. The bowl is coil built and each rib is deeply carved into the clay. The depth of the carving and the symmetry of each rib is exceptional. This is certainly one of the enduring aspects of her incredible artistry. Each rib is then polished with a stone to achieve the shine. Although it is a small piece, consider that each rib has two sides and how much surface area there is for this piece! The ribs are also very deeply carved into the clay and almost come to a point at the edge! Check out the image looking down on the bowl to see the depth and symmetry of this piece. Nancy says she can only polish three ribs in one sitting as they are so time-consuming. It is in excellent condition with no chips, cracks, restoration or repair. It is signed, “Nancy Youngblood Cutler” and it is from 1987. Simply an iconic piece of her pottery! Polly Rose Folwell is known for use of classic designs on her traditional inspired Santa Clara pottery. She learned to make pottery from her mother, Jody Folwell. This jar is fully polished and has an asymmetric rim. It has been fired a dark reddish brown with a nearly black rim. The design around the shoulder are etched feathers which encircle the piece. Above and below are cloud and rain designs. The jar is signed on the bottom in the clay. Paul Speckled Rock is a grandson of Severa Tafoya but learned to make pottery from Joseph Lonewolf (his then father-in-law). Paul’s son Adam Speckled Rock has made pottery, as well as his niece, Jennifer Tafoya. This is one of his iconic clay bears. He began making them in the early 1980’s and they remained one of his most famous forms. The bear is more modernized and this one is polished and fired red. There is a geometric heartline on the piece which he has highlighted with a blue clay slip. There is a stone arrowhead on the back and three parrot feathers. This is the bear’s “medicine bundle”. The piece is signed on the inside of the back leg, “Paul Speckled Rock, 1991”. It is in excellent condition with no chips, cracks, restoration or repair. Paul Speckled Rock is a grandson of Severa Tafoya but learned to make pottery from Joseph Lonewolf. This seedpot is from 1983. It is a very early piece of his pottery. When he first started to make pottery, he began making unusual shapes, which were very much like “rocks”. They were immediately distinctive in form and design. This piece is highly polished but with not design. It is the shape and angels of the piece and the highly polished surface which make it so striking. The piece is signed on the bottom in the clay, “Paul Speckled Rock, 1983”. It is in very good condition with no chips, cracks, restoration or repair. Madeline Naranjo creates beautifully carved and polished pottery. Each piece is coil built, stone polished and traditionally fired. The jar here is a classic shape with a wide shoulder and short neck. Around the neck are carved clouds which are matte. Below the shoulder is a carved avanyu (water serpent), which encircles the piece. The shoulder and the area below the avanyu are both polished. Note how her matte sections are sanded and perfectly smooth so that there are no indentations or areas where the matte might make a shadow. Her designs are always innovative and beautifully executed. The jar is signed on the bottom. Madeline Naranjo creates beautifully carved and polished pottery. Each piece is coil built, stone polished and traditionally fired. This is a taller seed jar. There are four parrots deeply carved into the clay. The bodies of each bird are matte, while the tail feathers and beak are polished. In the center of each is a carved birdwing. The area separating the birds is also polished. Note how her matte areas are sanded and perfectly smooth so that there are no indentations or areas where the matte might make a shadow. Her designs are always innovative and beautifully executed. The jar is signed on the bottom. Denny Gutierrez was known for his faceted melon bowls. As opposed to carving them, he would flatten out each rib out to create a “faceted” appearance. The result was a reflective surface and a very striking piece of pottery. This bowl is from 1992. 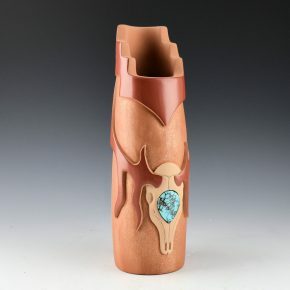 It is larger in size and there are 36 faceted ribs swirling around the jar from the rim to the base. 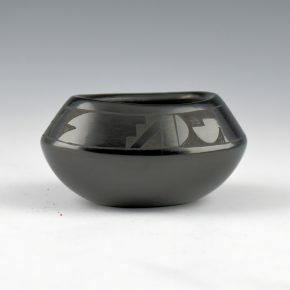 The bowl is very highly polished and fired a dark black. It is signed on the bottom in the clay, “Denny Gutierrez”. 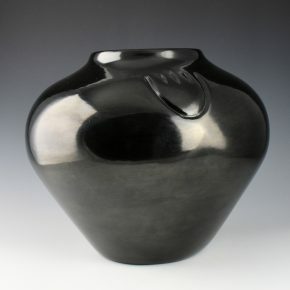 Toni Roller is known for her classic shapes and exquisite stone polished pottery. 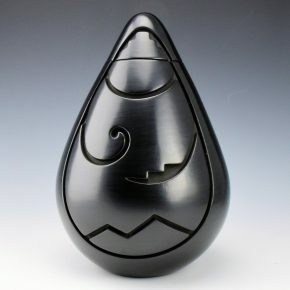 She is a daughter of Margaret Tafoya and has developed her own distinctive style yet adhering to the traditional methods and techniques of her mother. This bowl is from 1985 and it is a carved melon bowl with 16 ribs. Each rib is evenly spaced and carved into the clay. The entire surface is fully polished to a high shine. It was traditionally fired and it is signed on the bottom in the clay, “Toni Roller”. 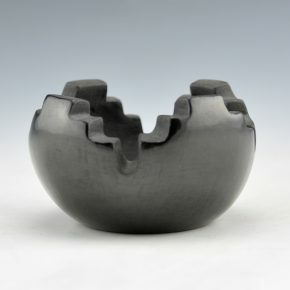 Denny Gutierrez was known for his faceted melon bowls. As opposed to carving them, he would flatten out each rib out to create a “faceted” appearance. The result was a reflective surface and a very striking piece of pottery. This jar is from 1991. It has 16 straight melon ribs, each flattened out to create the “facet”. They encircle the jar from top to bottom. The jar is very highly polished and it is in excellent condition with no chips, cracks, restoration or repair. It is signed on the bottom in the clay, “Denny Gutierrez”. Tina Garcia was well known for her focus on traditional shape and plain ware Santa Clara pottery. This jar was from 1991 and it is a classic piece of her pottery. The jar has a sharp shoulder and it slopes up to the mouth. There are three bear paws impressed into the clay. The entire piece is fully polished and fired a deep red. The bear paws are part of a story where a bear led the Pueblo people to water during a drought. It is signed on the bottom in the clay, “Tina Garica”. It is in excellent condition with no chips, cracks, restoration or repair. 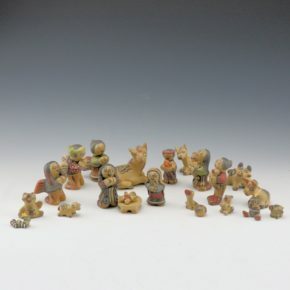 This nativity set by Margaret and Luther Gutierrez contains 22 different figures. This is the middle size of the sets that they made. There are Mary, Joseph, baby Jesus and the three wise men. The Wise Men are presenting gifts of bread and animals. There are additional animals of a cow, donkey, pig, horse, duck and more! This is also one of the few sets which includes three angels. There are two koshari figures and even one miniature seedpot. Each piece is signed and it does include pieces by Margaret & Luther, Pauline Naranjo (Luther’s daughter) and a couple by Margaret alone. The set is from the collection of Richard Spivey and was begun in 1977 and put together over the course of several years. They are each painted with native clay slips and they are all in very good condition with no chips, cracks, restoration or repair. Definitely a charming collection of work by this important family of potters! 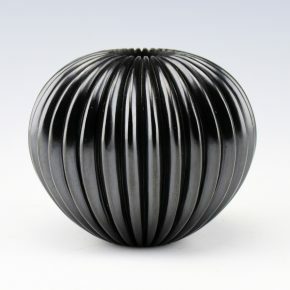 This is a striking wide shoulder jar by Margaret Tafoya. It is from the 1970’s. It is an unusual shape for Margaret’s pottery with a wide shoulder and a short neck. 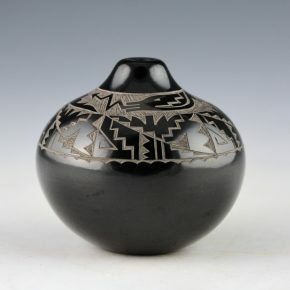 The jar is carved around the shoulder with a mesa and rain pattern. The design is repeated four times around the jar. The piece is very highly polished and deeply carved. It was fired a deep black. Interestingly, Margaet was at the peak of her career in the 1970’s. It was 1978-9 when she won consecutive “Best of Show” awards at Santa Fe Indian Market for two storage jar. There is certainly a wonderful precision in the carving, shape, and polish of this jar. It is signed on the bottom in the clay, “Margaret Tafoya”. It is in very good condition with no chips, cracks, restoration or repair. 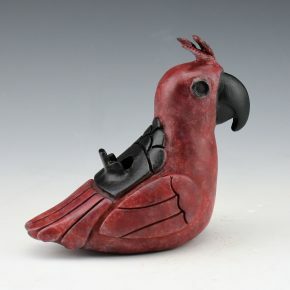 Tammy Garcia is known for her contemporary designs and use of traditional clay. This jar was made in 2000. It is a striking shape with with a round body and small neck. 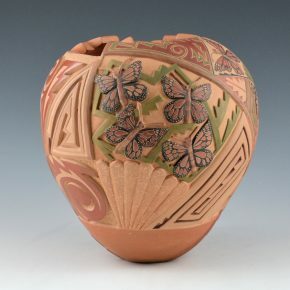 The design is a series of six butterflies encircling the jar. They are slipped with a brown polished clay and the heads are matte red. Near the base of the jar are flowers and Tammy has creatively used the angular melon ribs to represent the air, clouds and paths of the butterflies! The piece has an elegance of form and flow of design in every direction it is turned. The jar is signed on the bottom in the clay. It is in excellent condition, with no chips, cracks, restoration or repair. Tammy has won numerous awards for her pottery for nearly the past 30 years. Her creative work in clay, glass and bronze is found in museums worldwide. 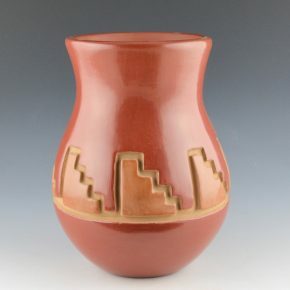 It is exciting to see how her contemporary work continues to move Pueblo pottery forward with it innovations. 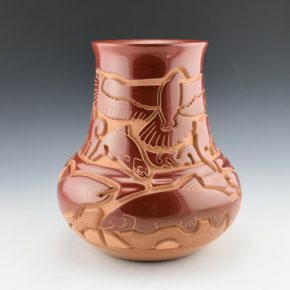 Robert Cleto Nichols is known for his deep carved pottery. Each piece is coil built, carved and stone polished. This bowl has a large fish chasing a smaller fish. 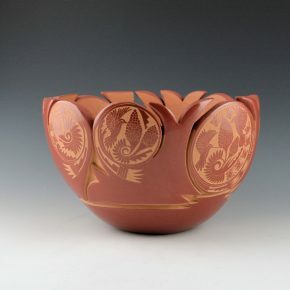 As the bowl is turned, the body of the larger fish is made up of kiva step and melon rib designs. Note the depth fo the carving! 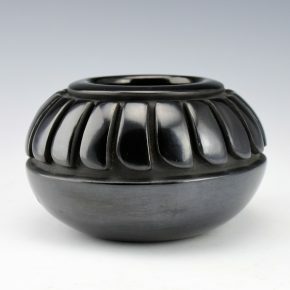 The bowl is traditionally fired black and signed on the bottom in the clay. 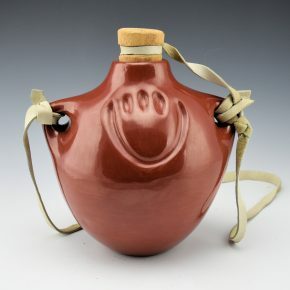 This is a stylized canteen by Tammy Garcia from 1997. 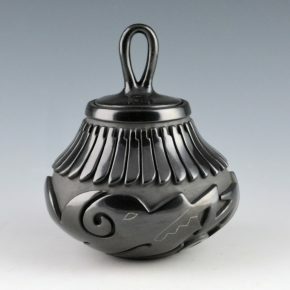 The canteen is carved, polished and traditionally fired black. 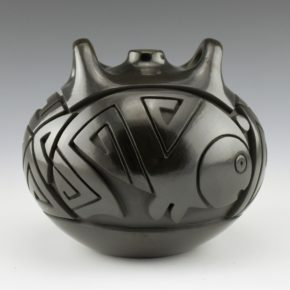 The design is inspired by the fish on Mimbres pottery from the 1100’s. The fish is on one side and as the canteen is turned there are linear geometric patterns. These patterns were also inspired by the linear designs on Mimbres bowls. The canteen is in the shape of a Pueblo woman’s canteen with the flat base and the handles on top. The piece is highly polished and precision carved. It is in excellent condition with no chips, cracks, restoration or repair. It is signed on the bottom in the clay, “Tammy Garcia, 97”. This is seedpot by Rosemary Lonewolf is from the late 1990’s. 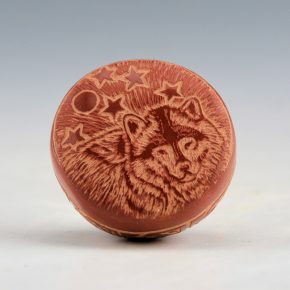 It is fully polished and there is an etched wolf on the top along with stars and a full moon. On the sides are basket designs. The contrast of the matte and polished areas accentuates her imagery. The piece is signed on the bottom “Apple Blossom”, which is her name in Tewa. It is in excellent condition with no chips, cracks, restoration or repair. This seedpot by Camilio Tafoya is from 1995. It is the last series of pieces he made. It was fully polished and etched with five chipmunks. They are gathering nuts. It is whimsical in style and there is a playfulness to the designs. The various colors are derived from natural clay slips. It is signed on the bottom “Camilio Sunflower Tafoya”. It is in excellent condition with no chips, cracks, restoration or repair. This is a striking original clay piece by Roxanne Swentzell. It is entitled “Admiration”. It is one of the classic style pieces by Roxanne. Here the potter is holding two of her pieces of pottery. There is something so endearing about the look on her face as she is looking at her pottery. The two bowls are part of the figure so this is all one piece. It is equally remarkable that both bowls are Mimbres in styles. This harkens back to the early Mimbres pre-historic pottery, considered some of the best and most refined ancient art in the world. The connection of the past with this innovative artist of the present and her impact on the future certainly reads throughout this wold piece. Note as well feet, the movement of the hands, the face, are all perfectly scuplted. Roxanne is able to achieve such a sense of emotion in the faces of her figures! This piece is in perfect condition with no chips, cracks, restoration or repair. There is a monumental bronze similar in style to this piece in clay which is located at Roxanne’s studio in Pojoaque (see last photo). This piece is from early 2000 and signed in the clay, “ROX”. Mary Ester Archuleta is the second youngest daughter of Margaret Tafoya. She has never prolific and most her pottery was made in the 1970’s and 1980’s. This canteen is a striking piece and fully polished a deep red. There are bear paws on both sides. The entire piece is fully polished. The bear paws represent a story of how the Pueblo people were led to water during a drought by a bear. 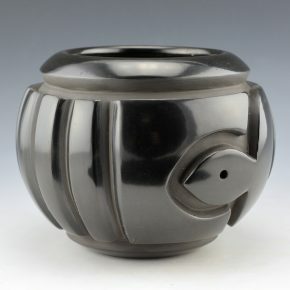 This particular style of canteen is one which is very reminiscent of the work of her mother, Margaret Tafoya. The stopper is hand carved and there are leather straps. It is signed on the bottom in the clay, “Mary E. Archuleta”. It is in very good condition with no chips, cracks, restoration or repair. 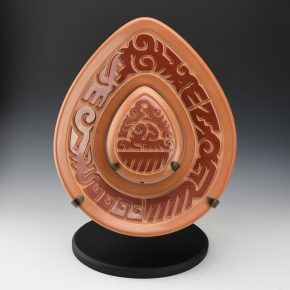 Teresita Naranjo is famous for her deeply carved pottery. Each piece was coil built, carved, stone polished and traditionally fired outdoors. She was a daughter of noted potter Christina Naranjo and a sister of Mary Cain. This wedding vase by Teresita is from the 1970’s. It is one of her classic shapes with the long necks and rounded spouts. 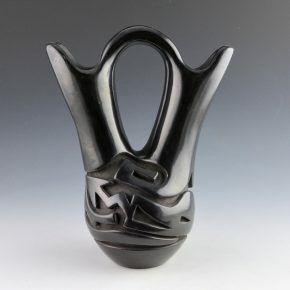 The body of the vase is deeply carved with a waters serpent (avanyu), which encircles the piece. As the vase is turned there are additional cloud and rain designs. The entire piece is beautifully polished and a classic for her work! It is signed on the bottom in the clay, “Teresita Naranjo” and it is in very good condition with no chips, cracks, restoration or repair. This is a taller miniature jar by Geri Naranjo. She is known for her miniature pottery and intricately etched designs. Here the entire piece is fully polished and around the shoulder are very tiny etched feathers. No, I was not able to count them all! But check out how close they are to each other! Below the feathers is a water serpent (avanyu), which encircles the piece. The body of the avanyu has cloud and rain designs. The remainder of the jar is very highly polished. It is signed on the bottom in the clay. It is in excellent condition with no chips, cracks, restoration or repair. Forrest Naranjo is a grandson of Rose Naranjo and a son of Bernice Naranjo. He learned to make pottery from his mother. This bowl is coil built, stone polished and traditionally fired brown and then etched with designs. 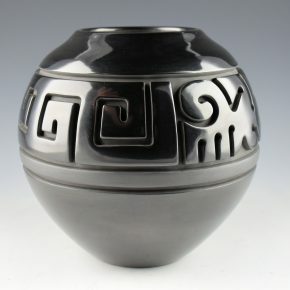 This bowl has an asymmetric rim and the designs are etched into the clay around the top of the jar. The design is an interesting story of the birth and various stages of the dragonfly. The various stages of the larvae and then the dragonfly itself can be seen! 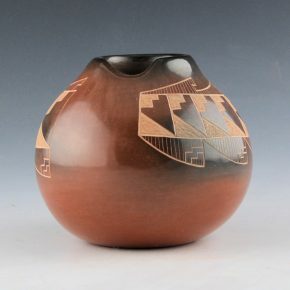 The style of his etching is modern yet pulls from traditional Pueblo designs. It is in very good condition with no chips, cracks, restoration or repair. Joy Cain (bl 1947) is a daughter of Mary Cain and a sister of noted potters Tina Diaz, Linda Cain, and Billy Cain. She began making pottery in 1965 but makes almost no pottery today. This bowl is very round in shape and very deeply carved. It has a cloud and lightning pattern encircling the bowl. 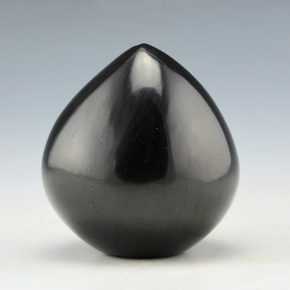 The surface is fully polished and it is a dark black coloration. The bowl is in very good condition with no chips, cracks, restoration or repair. It is signed on the bottom in the clay, “Joy Cain”. Ty Moquino is a son of noted potter Jennifer Moquino. At only 16 years old he is making some creative pottery! This is one of his clay masks. They are inspired by the science fiction he has read, along with being a commentary on the environment, sustainability and even imagery from Standing Rock. 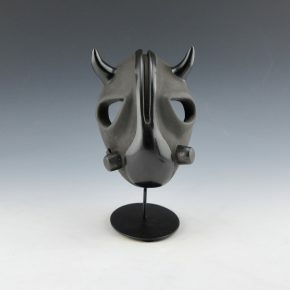 This mask is “Buffalo Warrior”, which is inspired by the shape of a buffalo skull. The respirator and horns are fully polished while the remainder of the mask is matte and slipped with mica in areas. It is an interesting piece reflecting on the connection of the buffalo to Native culture, their extinction, and their future. Also, the inherent symbolism of a warrior in the future wearing a mask representing the buffalo. It is a creative and thoughtful piece as part of his mask series. It is great to see new work from his young potter. Ty won the “Best of Youth” award at the Heard Museum Indian Market in 2017 for one of his masks! It is signed on the back. The piece will include a metal museum mount for it to be displayed and will take about a week for delivery. Annie Baca is a daughter of Cesencia Tafoya and known for her miniature pottery. This bowl is very highly polished and tightly painted. Her works are typically three inches or smaller, which is classified as a miniature. The design on this bowl is a water serpent (avanyu), which encircles the piece. There are cloud designs above the avanyu. It is signed on the bottom in the clay, “Annie”. The glassy shine and tight painting create a beautiful and traditional Santa Clara bowl! Annie Baca is a daughter of Cesencia Tafoya and known for her miniature pottery. This oval shaped bowl is very highly polished. Typical of her work it is formed with a very sharp shoulder. The designs are painted onto the polished surface. Looking at the bowl, there are cloud, rain and lightning patterns. The glassy shine and tight painting create a beautiful and traditional Santa Clara bowl! Candelaria Suazo is a daughter of potters Joe and Santanita Suazo. Her sisters include Martha Suazo (the wife of Art Cody Haungooah), Margie Naranjo, Mae Tapia and Shirley Duran. She learned to make pottery from her mother and has been making pottery for over 20 years. 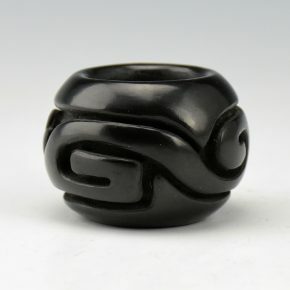 This miniature bowl is coil built and stone polished. It is etched with a Yei figure and then two-toned to make it black and sienna in coloration. Note the high polish and delicate etching on this piece. It is signed on the bottom. 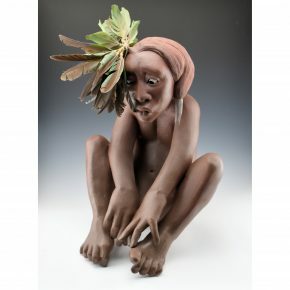 Tammy Garcia is known for her amazing pottery, as well as the creativity of her bronzes. This bronze is carved in the style she carves in her pottery, with various depths and layers. It is entitled, “Green Moth”. It has a Sikyatki inspired moth as the design in relief. 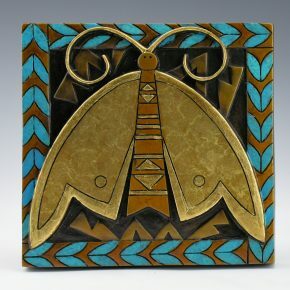 Behind the moth are some of her classic Pueblo geometric designs and a butterfly pattern around the edge as the “frame”. The bronze is made to hang on a wall, although it can also stand (or sit in an easel). 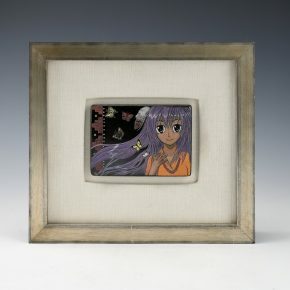 The piece has a striking use of patinas to enhance the coloration of the moth’s wings and the butterflies in the frame. The piece is signed on the side. It is the 21/35 in the edition of the bronze. Tammy Garcia is known for her amazing pottery, as well as the creativity of her bronzes. This bronze is carved in the style she carves in her pottery, with various depths and layers. It is entitled, “Gold Moth”. It has a Sikyatki inspired moth as the design in relief. Behind the moth are some of her classic Pueblo geometric designs and a leaf pattern around the edge as the “frame”. The bronze is made to hang on a wall, although it can also stand (or sit in an easel). The piece has a striking use of patinas to enhance the coloration of the moth’s wings and the plants in the frame. The piece is signed on the side. It is the 19/35 in the edition of the bronze. Mary Cain was a daughter of Christina Naranjo and a granddaughter of SaraFina Tafoya. She was known for her classic style Santa Clara pottery. 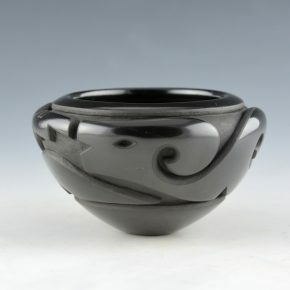 This bowl is carved with a cloud, lightning and wind pattern which encircles the piece. There is always a fluidity to her designs as they ebb and flow around the piece. The bowl is fired a dark black. It is signed on the bottom, “Mary Cain”. It is in very good condition with no chips, cracks, restoration or repair. 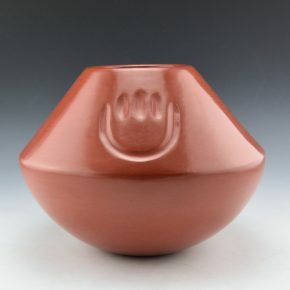 Toni Roller is known for her classic shapes and exquisite stone polished pottery. A daughter of Margaret Tafoya, Toni has developed her own distinctive style and this wide shoulder bowl is one of her original forms. It is fully polished and has four bear paws incised into the surface. The bear paws are symbols of a Pueblo story where a bear lead the people to water during a drought. The bowl was made in 1989 and it is in excellent condition with no chips, cracks, restoration or repair. Rose Simpson is one of the exciting innovative potters working today. She is a daughter of noted potter Roxanne Swentzell. This piece brings together two strong aspects of her clay work. The geometric rectangular shapes create a stylized pueblo appearance. The small opening are much like doors and windows. The shapes are clay and are all one piece and textured. However, it is the clay work on her figure which is so dynamic. 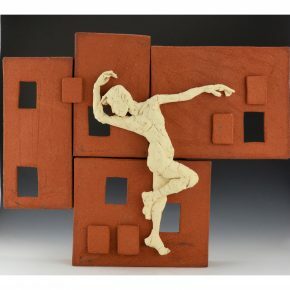 Rose has found a creative way to create her figurative work, with overlapping slabs of clay. The figures are realistic in form yet almost otherworldly or dream-like in their appearance. The various small slabs on the figure give an additional sense of movement as if the dancing figure is in motion. It is excellent condition with no chips, cracks, restoration or repair. Rose continues to expand her style in various museum exhibitions around the US and create new and more dynamic works in clay. Look for her upcoming exhibition at the Wheelwright Museum in Santa Fe. 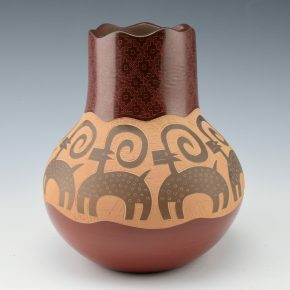 This seedpot by Camilio Tafoya is very intricately designed. It would seem that it most likely was made, polished and the designs were begun by Camilio and then the designs were finished by his son, Joseph Lonewolf. While it is signed by Camilio, it would suggest that the piece was already polished. However, there are indicators that it was finished by Joseph, as he finished several of the pieces which Camilio had in process before he passed. 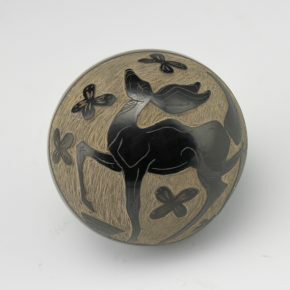 The deer are all very intricately etched and designed than on any of the piece finished by Camilio from 1990-5. There is is a large buck with antlers extending over the top of the seedpot. On the opposite side there is another deer with smaller antlers and two does. 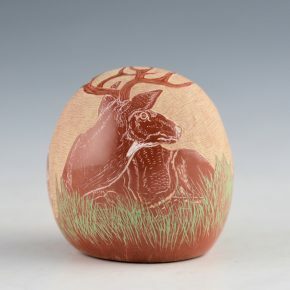 The deer are very intricately designed and they are much closer in style to those of Joseph. As well, there is the number on the bottom, which is precision-etched, and the last letters are JL, which are probably Joseph’s initials as the end of the numbering system. The numbering system used by Camilio was typically much shorter and a bit more stylistic in design. Overall, the piece is in excellent condition with no chips, cracks, restoration or repair. 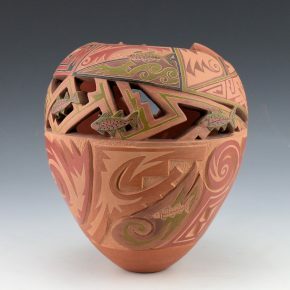 Beginning in the early 1970’s, Joseph Lonewolf revolutionized the world of Santa Clara pottery by incorporating his sgraffito (lightly etching the surface of the clay) and incised (more deeply cut into the clay) designs. This bowl is very thin walled and has an indented bottom. It is fully polished red and etched with a single medallion. 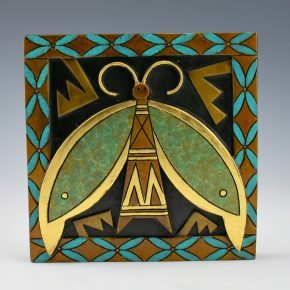 There is a Mimbres style grasshopper or cricket as the design. Not the depth and precision of the matte area behind the insect! There are rectangular green polished areas surrounding it, which represent the grass. The use of the green clay slip in 1973 was quite new and a extraordinary addition to native clay colorations at the time. The remainder of the bowl is fully polished red. The precision of the designs and the shine of the polished surface create a perfect balance. This piece is in perfect condition with no chips, cracks, restoration or repair. It is signed on the bottom in the clay. 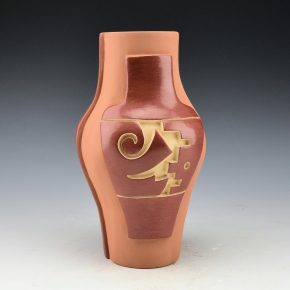 Beginning in the early 1970’s, Joseph Lonewolf revolutionized the world of Santa Clara pottery by incorporating his sgraffito (lightly etching the surface of the clay) and incised (more deeply cut into the clay) designs. This seedpot is from the 1990’s. It has the yearly symbol of a heart with a cross in it on the back. On the front is the classic Feathered Water Serpent which was used by Joseph Lonewolf and his family. Note the intricate detail in the head and the feathers. There is an additional butterfly etched into the back of the piece. The precision of the designs and the shine of the polished surface create a perfect balance. This piece is in perfect condition with no chips, cracks, restoration or repair. It is signed on the bottom in the clay. Mary Ester Archuleta is a daughter of noted potter Margaret Tafoya. This water jar has a round body and a slightly turned out neck. 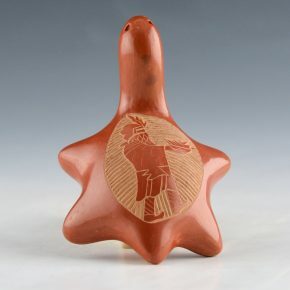 It is fully polished red and carved around the body with a kiva step design. 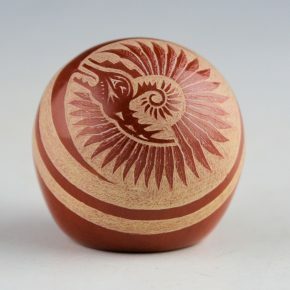 The carved areas are polished tan in contrast to the red of the remainder of the jar. The tan is the natural color of the clay and always difficult to achieve this coloration. There is also the traditional cream-colored slip painted into the carved areas. It is signed on the bottom in the clay, “Mary E. Archuleta. It is in very good condition with no chips, cracks, restoration or repair. Mary is the second youngest daughter of Margaret Tafoya. She married into San Juan Pueblo in the late 1960’s and created most of her pieces in the San Juan inspired style. While she no longer makes much pottery, her work is creative and distinctive in style and coloration. This is one of the largest pieces we have had by Angela Baca. She was famous throughout her career for her melon ribbed pottery. The form is derived from the melon and squash grown in the area and so there is always an organic style to the shape. This piece is round and has 32 ribs carved into the clay. The entire surface of the bowl is fully polished, including the space between each of the ribs!. The bowl is signed on the bottom in the clay, “Angela Baca” and it is in very good condition with no chips, cracks, restoration or repair. The butterfly is symbolic of beauty and the the interlocking rings medallion represents the attachment between friends and was the yearly symbol for 1997. 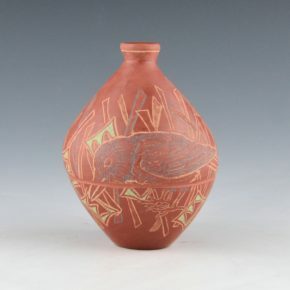 Beginning in the early 1970’s, Joseph Lonewolf revolutionized the world of Santa Clara pottery by incorporating his sgraffito (lightly etching the surface of the clay) and incised (more deeply cut into the clay) designs. The piece is signed on the bottom and includes the signed artist card. It is in excellent condition with no chips, cracks, restoration or repair. 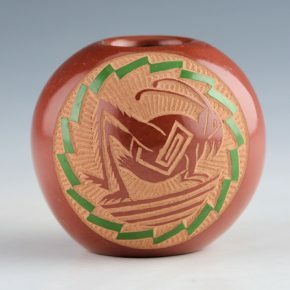 This miniature seedpot by Camilio Tafoya is from 1975. It is etched with a feather pattern around the neck. The area below the design is fully polished red. It is signed on the bottom “Camilio Sunflower Tafoya”. It is in excellent condition with no chips, cracks, restoration or repair. Adam Speckled Rock is the son of noted potters Paul Speckled Rock and Rosemary Lonewolf. He is a grandson of Joseph Lonewolf and a great-grandson of both Severa Tafoya and Camilio Tafoya. 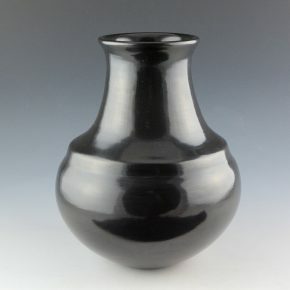 This tall jar is fully polished below the shoulder and matte above. The design is a series of bluebirds in the reeds. The design is etched into the clay and additional clay colors are added to highlight the designs. The jar is signed on the bottom in the clay. It is in very good condition with no chips, cracks, restoration or repair. 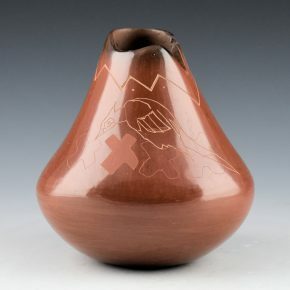 This seedpot by Camilio Tafoya is from 1995. It is the last series of pieces he made. It was fully polished and etched with an otter, trout, and skunk. There is a simplicity and playfulness to the designs. The various colors are derived from natural clay slips. It is signed on the bottom “Camilio Sunflower Tafoya”. It is in excellent condition with no chips, cracks, restoration or repair. 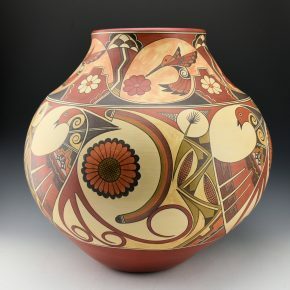 Polly Rose Folwell is known for use of classic designs on her traditional inspired Santa Clara pottery. This jar has a wide shoulder and an elongated neck. It is fully polished and fired brown. The rim is carved with a mountain design, which is then replicated in an incised mountain design around the neck. There is a single bird etched into the clay. Below the birds are the Folwell family “x’s”, which are often found on their pottery. The jar is signed on the bottom in the clay. This storage jar is one of the classic shapes by Jason Ebelacker. He is a son of Richard Ebelacker and grandson of Virginia Ebelacker. 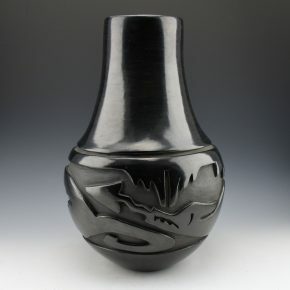 His father and grandmother were both known for their storage jar shapes, as well as his great-grandmother, Magaret Tafoya. Jason creates a similar form with the high shoulder and the small neck. The distinctive shape gives the jar a feeling of size and width. 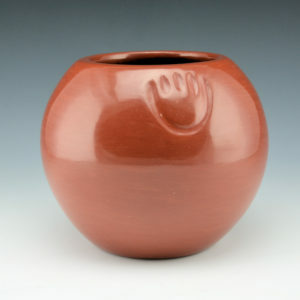 The jar has two bear paws impressed into the clay and they are fully polished, as is the entire surface of the jar. The bear paws are symbolic of a Santa Clara story where a bear led the Pueblo people to water during a drought. This jar is as much historic as it is modern in appearance. 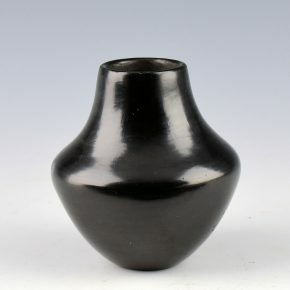 The jar is traditionally fired black. Jason is certainly one of the younger potters to watch! 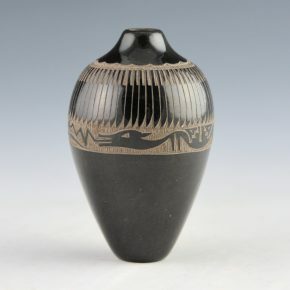 Joseph Lonewolf began making pottery in 1970-1. This is a very early piece of his pottery. It is a more classic shape with a wide shoulder which slopes upward. The bottom half of the piece is fully polished. 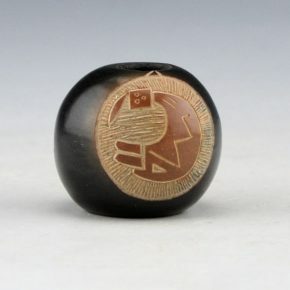 The top is etched with a water serpent (avanyu) with a feather pattern, which is the style used by him and his family. The matte background area is deeply etched swirls up from the shoulder and over the rim. It must have been exciting in 1971 to see work that was so new and unique at the time! This piece is in perfect condition with no chips, cracks, restoration or repair. It is signed on the bottom in the clay. 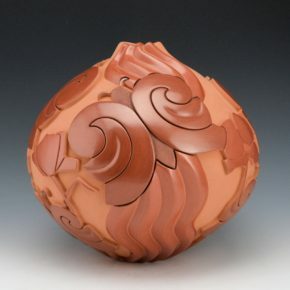 Susan “Snowflake” Romero’s pottery is highly polished and intricately etched with detailed imagery. Many of her skills are ones that she learned from her father, Joseph Lonewolf. 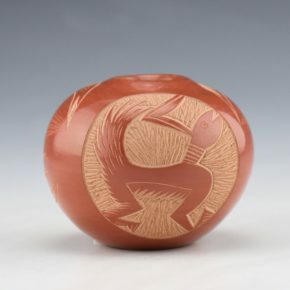 This seedpot has two Mimbres inspired parrots on the top of the piece. They are etched so the surface is both matte and polished. 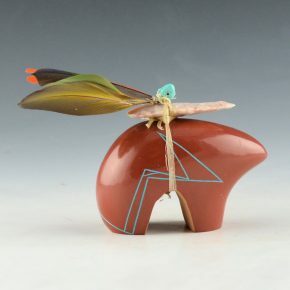 On the side is a hummingbird etched in the Pueblo style. It is in perfect condition with no chips, cracks, restoration or repair and signed on the bottom. Mary Ester Archuleta is the second youngest daughter of Margaret Tafoya. She has never made a lot of pottery, and most of it was in the 1970’s and 1980’s. A majority of her pottery was inspired by the incised San Juan style of pottery as she married into San Juan and lived there. This bowl is a classic round shape with bear paws as the design. It is perfectly polished and a stunning deep red color. It is signed on the bottom in the clay, “Mary Archuleta.” It is in perfect condition with no chips, cracks, restoration or repair. This plate was made by Preston Duwyenie and polished and incised by Debra Duwyenie. The design on the front is fully polished and full of imagery. The design is a flowering plant which extends up from the vase. Each of the flowers are etched into the clay and the center of each is matte, which is just where the polished slip has been etched away. For nearly each flower is a hummingbird, each of which are also etched into the clay and with matte bellies. There are 19 hummingbirds on the plate! There are also additional butterflies and note near the top is a sunface and extending from the sun are rain and cloud designs. The back of the plate is fully polished and signed with Debra’s name and Preston’s hallmark. 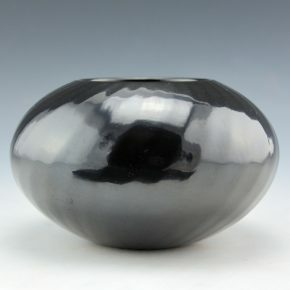 This bowl by Gloria Garcia is fully polished and fired black. The design is a series of eight turtles encircling the piece. Each one has additional designs etched into their shell. 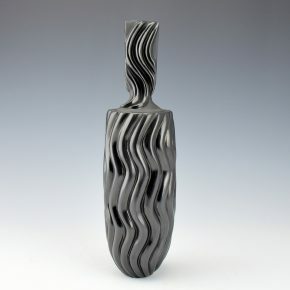 Gloria’s combination of polishing and etched designs is always striking. This piece is signed on the bottom with her Tewa name “GoldenRod”. 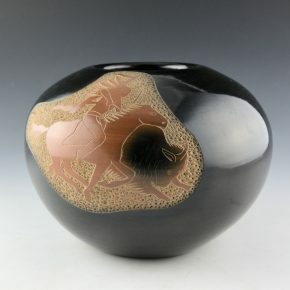 This is a striking lidded jar by Nancy Youngblood. The jar is deeply carved with a water serpent around the body of the piece. Note the delicate swirls and sharp edges carved into the clay to create the body of the avanyu. Around the neck of the jar are 32 deeply carved feathers. Each feather and the avanyu are all stone polished to create a stunning shine! 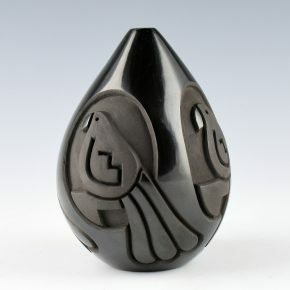 There is a sense of movement in the design as the feathers seems to swirl around the piece. The lid is a loop which is fully polished! It is reminiscent of some of Nancy’s early work when she would create miniatures with very thin handles! The lid fits perfectly into the neck of the jar. 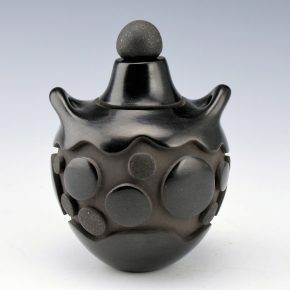 The entire piece is traditionally fired to a dark black and it is signed on the bottom in the clay. Christina Naranjo was a daughter of SaraFina Tafoya and a sister of Margaret Tafoya and Camilio Tafoya. 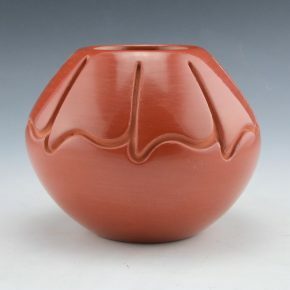 She was known for her classic style carved Santa Clara pottery. This is definitely the largest piece of her pottery we have had in the gallery. It is a tall water jar with a long neck. Around the body of the piece, it is fully carved with a water serpent (avanyu), as the design. 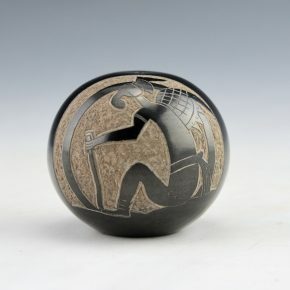 The avanyu encircles the jar in a band of design but note the exceptional complexity of the imagery. The area clouds and rain and lightning in the pattern and they utilize the normal band but also the negative space. The long neck is also fully polished. The style of her carving is certainly significantly different than that of her sister, Margaret Tafoya. The jar is signed on the bottom in the clay, “Christina Naranjo”. It is in very good condition with no chips, cracks, restoration or repair. Christina has a wonderful legacy in the work of her daughters Mary Cain and Teresita Naranjo, as well as her great-granddaughters Tammy Garcia and Autumn Borts. This is the first time Nathan Youngblood has created a double set of plates in the teardrop shape. Has has made a similar style with the floating center medallion using round plates. However, there is an increased level of difficulty in creating this concept with his signature teardrop form. The plate is made and then the “inner” teardrop plate is cut away. Nathan then designs both of the plates so that they visually function as one unit. The inner plate has a lightning and rain design. Note on the upper edge the deer track and the star. “Deer Path” is his name in Tewa and so he will often use that imagery in his designs. The outer plate has a rain and walking bear paw design around the base and above are clouds. The rim of both pieces is polished tan, while the center is carved and polished red. After the two pieces were fired, we had a stand made so that they would sit together. When looking straight on, it appears to be one piece. When looking from the side, the inner plate extends forward. The deep red clay slip on these plates is exceptional and contrasts perfectly with the tan areas. While the shape, carving, and designing might seem like enough, Nathan also takes his pottery one step further. After it is fired, he uses small screwdrivers and scrapes the sides of the carved designs and the recessed areas, to create a visually striking contrast. It is signed on the back in the clay with his name and deer tracks, which represent his name in Tewa. This jar by Nathan Youngblood has a traditional storage jar shape. The jar is carved around the center with a walking bear paw design along with a keyhole doorway design. As the jar is turned there are additional cloud designs. The carved designs are large but striking in appearance. The top and bottom sections are fully polished to Nathan’s glass-like appearance. Simple. Elegant. The jar is signed on the bottom in the clay “Nathan Youngblood” and the hallmark of his name in Tewa. This is one of the larger pieces we have had by Linda Cain. Linda is a daughter of Mary Cain and the mother of Tammy Garcia and Autumn Borts. This jar is carved on one side with a jar of a similar shape which has a carved design in the center! The center carved pattern has a cloud, bird and lightning design. It is a carved jar on a carved jar. The sides are deeply carved and sanded smooth. The back of the jar is fully polished red. It is a striking and interesting piece of her potter. It is signed on the bottom in the clay, “Linda Cain”. Stunning! Lois Gutierrez is one of the few potters who continues to create large storage jars. Check out the size of this piece, as it is massive! As well, she is one of the only Pueblo potters who makes a true polychrome vessel (more than 3 clay colors). This jar has five different natural clay colors utilized. The neck of the jar has hummingbirds and flowers. Each bird is separated by a cloud pattern. Around the body of the jar are swirling birds and flowers. Separating each of the birds is a rainbow (with 5 colors) and then a stalk of corn. Each stalk is a different color representing the different directions (red, white, yellow and blue). The bodies of each of the birds have a detailed cloud pattern in the center. The jar is a beautiful combination of colors and traditional designs. Few of her pieces have this level of complexity in the designs! Lois’s ability to create such beautifully painted scenes with clay is remarkable in addition to her portrayal of a cultural legacy in design in clay. It is signed on the bottom “Lois 2018”. The last photo is one of the storage jar in the fire at Lois’s house at Santa Clara Pueblo…a very HUGE fire! !